Is Your iPhone 5 Camera Seeing Purple? Initially I was told that it shouldn't happen and that it is strange. My call was escalated to a senior support individual who again said it was odd and shouldn't happen. I sent her some pics of the issue and she in turn sent them to the engineering team. Her final response is what you can see at the top of this article. Some photography experts have speculated that the purple flare is a product of the sapphire glass covering the iPhone 5's camera. 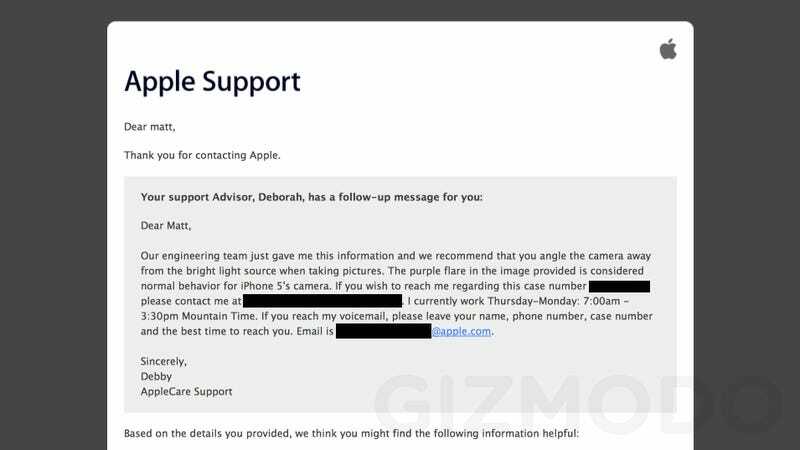 So it is final, folks: Apple says that, if your photos have a purple flare, this is totally normal behavior of the iPhone 5's camera. You are just holding it wrong.